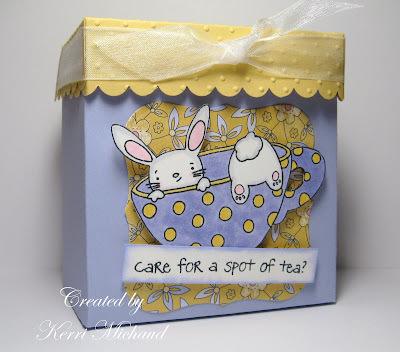 Ever since I saw this tutorial on Holly McMillen's blog, I've been wanting to make one of these adorable tea boxes!!! This past weekend I found this stamp set~Tea For Two by My Favorite Things~at a local stamp store, and I snatched it up : ) I just love this image, and the little mouse is just as sweet! I followed Holly's tutorial using Almost Amethyst for my box, and So Saffron for my lid. After I added the scallops, I ran the top through my Swiss Dots CB Folder. This was a two step process to get the whole thing embossed, so I had to be careful to line it up correctly. I added the ribbon to the top, but only to 3 sides, because I found if you wrap it all the way around, the top doesn't open properly. I stamped the image with Memento Tuxedo Black ink, colored it with Copics, and cut it out. I cut the dp from SU Tea Party (how appropriate, huh?) with my Labels One Nestabilities, then popped my image up on foam squares. I stamped the sentiment, cut around it with my paper trimmer, and sponged Almost Amethyst along the edges. That was it! Thank you Holly for the wonderful tutorial! I can't wait to fill this up with some tea bags, and give it to someone special! So super cute! Yet another idea for me to play with! I would love a tea!